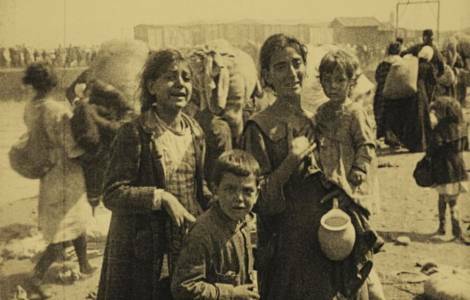 Jerusalem (Agenzia Fides) - An Israeli parliamentary vote on Tuesday 26 June for recognising the killings of Armenians as genocide was cancelled because of government opposition. Last month the Knesset had approved a motion penned by Tamar Zandberg of the left-wing opposition Meretz party to hold a plenary debate and vote on recognising the Armenian genocide. Turkey had expressed its opposition and to try to ensure the support of the governing coalition for her motion, Zandberg agreed to postpone the vote until after Sunday's Turkish elections. It became clear that the coalition was still opposed to Zandberg's initiative, even after Turkish President Recep Tayyip Erdogan's re-election on Sunday 24 June. It was Tamar Zandberg, the leader of Meretz, who withdrew the bill, after the government coalition and the Foreign Ministry had asked to remove the expression "Genocide" from the text under discussion to replace it with the words " tragedy" or "horrors". It was the President of the Knesset himself, Yuli Yoel Edelstein, who proposed the adjustments to the text under discussion, after the government parties had received the signal that the expression "Armenian Genocide" would not be approved. The postponement of the discussion and of the Genocide vote is interpreted by the Turkish media as a signal of relaxation sent by the Israeli government to the Turkish leadership. At the beginning of June, as reported by Fides (see Fides 5/6/2018), the President of Parliament, Edelstein had rejected criticism for postponing the discussion on the bill for the recognition of the Armenian Genocide. Edelstein, on that occasion, had claimed the intention to promote the recognition of the Genocide by responding to Archbishop Nourhan Manougian, Armenian Apostolic Patriarch of Jerusalem, who in a letter had expressed his bitterness for the news about a possible stop of the process initiated by Israeli institutions to discuss and eventually approve the recognition as "genocide" of the anti-Armenian massacres perpetrated in Turkish territory between 1915 and 1916. In previous days, Israeli media had reported the input which came from the Israeli government to postpone the debate on the issue of the Armenian Genocide until after the Turkish presidential and parliamentary elections on 24 June. According to Israeli observers and analysts, the opening of this discussion in such a sensitive moment could have politically favored President Recep Tayyip Erdogan, becoming a topic of his electoral campaign. After the harsh diplomatic clash between Israel and the Turkish government following the last massacre of Palestinians in Gaza, the proposal for the recognition of the Armenian Genocide had been presented to the competent offices of the Knesset by MP Itzik Shmuli, a member of the "Zionist Union". The proposal was supported by at least 50 parliamentarians belonging to both the governing Parties - including Likud - and those of the opposition. This bill also provided for the establishment of an annual commemoration day for the Armenian Genocide in Israel. Three months earlier, on February 14th, the Israeli Parliament itself had in fact rejected a bill presented by Yair Lapid, representative of the center party and layman Yesh Atid, who would have made the recognition by Israel of the "Armenian Genocide" official. The Israeli Deputy Foreign Minister, Tzipi Hotovely, had declared that Israel would not have officially taken a position regarding the issue of the Armenian Genocide, "taking into account its complexity and its diplomatic implications".